The poster promised the moon. Stuck outside Mumbai University’s linguistics department, it said: “Keen to travel abroad without breaking the bank? Eager to give yourself a head start learning French, German or another foreign language? Then sign up right away for our Esperanto Club!" One Thursday afternoon in July, about 15 students, piqued by the poster, assembled in a nearby room. “I promised you a couple of grand things," said Rohan Dharwadkar, the poster’s author, to the students. “And it wasn’t just for the heck of getting you here." Esperanto, he claimed, could provide an easy gateway to learning Romance languages and a passport to couchsurfing through fellow speakers’ homes. Dharwadkar, a linguistics master’s student, plunged into a lecture on Esperanto’s background and history for the neophytes. With about two million speakers, Esperanto is the world’s most widely spoken “artificial" language. In 1887, L.L. Zamenhof, a Polish Jew, published a booklet in Russian announcing his plans for a new language. Zamenhof, who had grown up seeing close-hand the friction between Poles, Russians, Germans and Jews, believed the world needed a simple, functional language to smoothen interaction between linguistic groups. The multilingual doctor felt tensions would abate if only people understood each other better. The idea gained some traction, with an inaugural global conference held in 1905 in France and the establishment of the Universal Esperanto Association in 1908. Built on 16 basic grammar rules, using the Roman script and weaving influences from Latin and the modern Romance languages, at first glance Esperanto appears robustly logical, attractively simple. Nouns don’t have genders, and an endless combination of words can be fashioned from a limited tool kit. “In most languages there is some kind of irregularity, which to the learner feels like an immense task," said Dharwadkar, who taught himself the language online. “Here what you see, is what you get." As the class rolled on, worksheets were handed out, conversation attempted. “Saluton!" the students chanted together, the greeting for hello, “Bone gis!" they said for “Okay, bye". 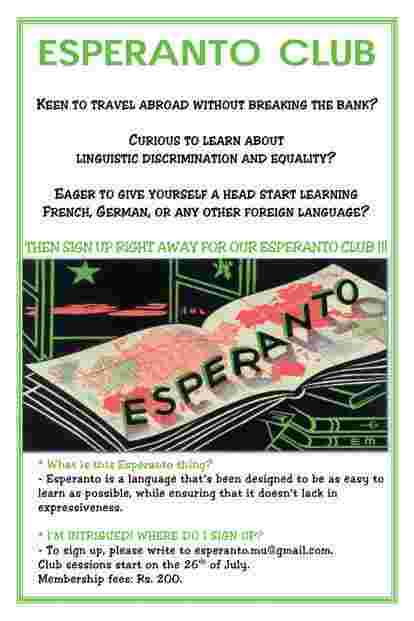 While this was the first session of the new club , Esperanto first surfaced in India in the 1920s, and saw a resurgence in the 1960s once the famous Esperantist Lakshmiswar Sinha translated Tagore into the language and established the Bengali Institute of Esperanto. Sinha learnt it while studying abroad. In the following decades interest was sporadic, with learners coming and going in waves. But in the past few years this tiny tribe has grown rapidly. Apart from the Mumbai University club, Premji University (APU) in Bengaluru set up a club in 2014, the Indian Institute of Science Education and Research (IISER) in Pune floated their club early this year, and Dhruba Chand Halder College in South 24 Paraganas, West Bengal, began offering a course last year. This December, Esperantists will gather in Tirupati for their first national conference since 2013. “It looks like we are entering an interesting phase," says Giridhar Rao, a linguistics professor at APU and former general secretary of the Indian Esperanto Federation . “Maybe because of the spurt of interest in invented languages like in the film Avatar (N’avi) and the show Game Of Thrones (Dothraki), people are attracted to planned languages." Most of these initiatives do not offer formal certification, usually measured in six levels running from A1 to C2, according to the Common European Framework of Languages. “Let it be fun," says Avinash Pandey, head of Mumbai University’s linguistics department, and himself a new learner. But it was something deeper than just fun that had fuelled him. “We were talking about linguistic justice and languages dying out and thought of this as one of the dimensions of the solution," he says. Often associated with left politics, Esperanto sprung as an experiment from ideas of social justice and overthrowing linguistic hegemony. Its adherents say dominant languages like English have contributed to erasing identities and furthering insecurities of marginalized groups. “One of the long lasting effects of colonization is of the mind, where one believes the colonizer is superior and their own culture is worthless. Getting rid of this is only possible if we have a resource for meaningful communication," says Rao. At APU, aside from the weekly club with 40 members that he helms, he also teaches an optional course in Esperanto and linguistic diversity. “The point of Esperanto has been to defend the rights of people to use their own language as much as possible," says Probal Dasgupta, a linguistics professor at ISI in Kolkata and former president of the Akademio de Esperanto, a scholarly body that regulates the language. “It is not about using Esperanto all the time but having limited use for an international language." G.N. Devy, scholar, writer and head of the People’s Linguistic Survey of India, has often made a related point: the importance of promoting linguistic diversity to preserve cultural knowledge. Dasgupta, considered among the country’s most prominent Esperantists, began learning the language at the age of 14 one summer in the 1960s when he chanced upon an Esperanto book. Within two months, he had mastered it, and began corresponding with other speakers across the world. When Lakshmiswar Sinha donated his books to the National Library of India in Kolkata, Dasgupta was the only one who could read and catalogue them. Rao himself stumbled on to the language when he met Dasgupta and heard about Esperanto’s rich science fiction. “In India, for those who learnt the language in the earlier waves, there wasn’t a follow-up plan for getting them deeper into the culture," says Dasgupta, estimating a few thousand ever learnt it. “That is unlikely to happen now. People are more connected and in general more driven." Much of the interest here and abroad can be chalked up to the vast possibilities offered by virtual platforms. In 2015, Duolingo, the language learning portal, introduced an Esperanto learning option (which now has 100,000-plus users) followed by the app Amikumu in 2017. The internet has helped connect older learners who might have fallen out of touch or new learners looking to practise with others online. A 90-member WhatsApp group for active Indian Esperantists has also consolidated a core group of speakers. But some say the entire project is utopian—and ultimately just an oddball experiment. “The fundamentally flawed idea on which it rested was that the problems of the world were due to linguistic misunderstandings and if people understood each other better, those problems would disappear," says Alok Rai, a former English professor at Delhi University, whose research is focused on language and culture. “I fully respect the motivation but it was an idealistic mistake because language is never perfectly transparent; it is more often than not used to dissemble and deceive, for ambiguity and ambivalence, and the idea that the problems of the world are because of language is a flawed one." Even Esperantists admit that it never transformed into the common linguistic currency Zamenhof had hoped for. “Once, there were Esperanto speakers who believed that Esperanto might become the lingua franca of India, but the international strength of English, on the one hand, and the regional dominance of Hindi, on the other, have (sadly) prevented the discovery of neutral linguistic ground among the many competing languages of the subcontinent," says Humphrey Tonkin, a professor at the University of Hartford in Connecticut, former Universal Esperanto Association president and lifelong Esperantist. “For a language to succeed, it needs power and prestige and it needs economic justification. Esperanto, a logical and sensible solution for India, has in the past lacked these advantages…"
Still, there are myriad attractions—it has its own literature, films and art. Since it is not attached to a territory, and is no one’s first language, it nourishes an organic, passionate sense of community even across borders. “You’re automatically broadcasting to the world that you are open to new ideas, you are a pacifist, not an ultra-nationalist," says Dharwadkar. As with any new language, it is a gateway to another universe. “Part of the benefit was opening up my friend circle to include people who have never needed English," says Rao, who recently returned from the annual global conference in Lisbon with 1,600 participants from 75 countries. “With English I thought I had the keys to the world. But with Esperanto I discovered a whole new one."